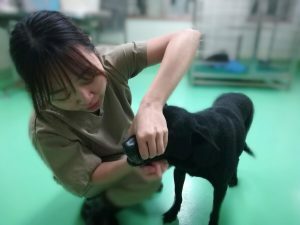 Last month, I have mentioned one of my duty in kennel is medicine feeding, so this time I would like to introduce my practice of it. First, I will prepare the medicine and appease their emotion, to let them not to be nervous and resist my touch. Use one hand hold its chin. Use the thumb and index finger of the other hand to push their upper lip into their month to wrap the teeth from the back of the canine teeth, then open their month. This way can avoid dog bites me since they will not bite their upper lip. Try to put the medicine close to the throat as much as possible, since they may spit it out if you just put it in their tongues. Don’t underestimate how clever they are. After that, shut their month and don’t let go immediately. Blow a breath to their nose or sweep their throat gently, and they will get the medicine down due to the reflex action. 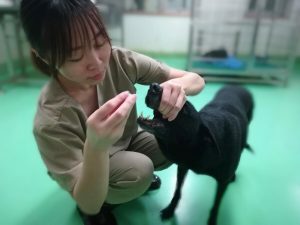 If the dog swallowed the medicine cooperatively, I will give them some snacks as a reward. Gradually, they will get better and better on medicine feeding. 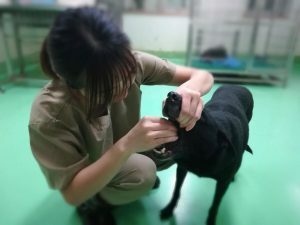 The dog in the above photo is very well-behaved, so I feel comfortable about using this practice to feed medicine. 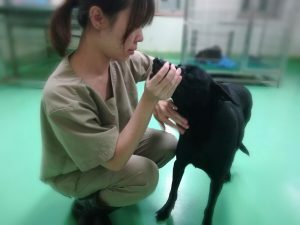 However, if dogs resist of it, I suggest people try other method, since the most important thing is to get their medication on time and back to health as soon as possible. Most of the exams were dated in this month so I spent most of my time studying. In pathology lessons, we have to study not only the microscopic view of the tissues, but also the general morphology of them, which makes it really hard to memorize them all. On the other hand, pharmacology lessons requires 100% attention since the teacher speaks really fast and we have to take a lot of notes. We are still in the introduction stage where we haven’t learn what particular drug types do to our body yet. The greatest sacrifice for me of deciding to come to Taiwan for study is the time of getting along with my family, but luckily, Taiwan is much closer to Hong Kong than the western countries, so it could be quite convenient and cheap for my family and friends to come visit me in Taiwan. In November, the most exciting thing for me was that my father was going to Taipai! This is actually the second time for dad to come to Taiwan for a visit indeed, and it lasted for 10 days which is the same as last year. Sadly, my workload is much heavier than last year and there was a biochemistry exam waiting for me, I could not leave the whole holiday for family. Instead, I could only bring him for a dinner at night. After the exam, we visited to the famous spot of Taiwan –Yangmingshan. The scenery is spectacular without doubt, but the most enjoyable thing is the opportunity to be together with family, which is really rare these years. Hope that all my family could live healthily and cheerfully!